So, I’m reading this article entitled: “Physicians excited about lab coat pocket-ability of Apple’s iPad mini” and I suddenly have an epiphany. Or, at least, a mini-ephiphany. Or indigestion. Not exactly sure which. Anyway, it occurs to me as I’m reading this article that there is an entire sector of computing where the iPad, in general, and the newly minted iPad Mini, in particular, have no competition. They OWN this market. Picture a doctor walking from patient to patient, either in their private practice or in a hospital setting. 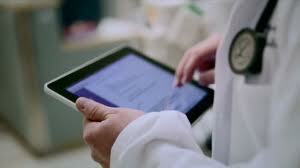 Picture them inputing data into an iPad or using the iPad to share information with their patients. Now picture them holding the iPad Mini in one hand and doing the same kinds of things…then slipping the iPad Mini into thier coat pocket. An easy picture, no? The picture of the iPad works, but the picture of the iPad Mini – held in a single hand – just feels right, at least to me. In July, I wrote an article entitled: “The PC is the Titanic and the Tablet is the Iceberg. Any Questions?” The purpose of that article was to show how the tablet would undercut the PC because many of the things that the tablet did well, the PC did poorly or not at all. I went back and re-visted that article with the iPad Mini in mind. Tablets excel at working while you are standing. The iPad Mini would do most of those tasks even better. Tasks done by matre d’s, inventory takers, tour guides, concierges, face-to-face service providers and order takers of every kind, would benefit from the use of the iPad Mini. Tablets excel at working when one has to move and stop and move yet again. The iPad Mini would do those tasks even better. Car dealerships, like Mercedes Benz, are giving tablets to their salespeople. European doctors are rapidly taking to the tablet. Service technicians at Siemens Energy are using tablets while servicing power installations. Scientists are using tablets during field research. Nurses, realtors, journalists, park rangers, medical technicians…the list of users and uses is nearly endless. They would all benefit from the use of an iPad Mini. If you’re in Sales, you’re into Tablets. For some salespeople, the larger iPad would make a better presentation device. For many others – and perhaps most others – the iPad Mini would do the job even better. Whether you’re traveling or standing or presenting or taking an order and acquiring a signature – tablets are a salesperson’s best friend. An iPad Mini would be more like a bosom buddy. While the PC makes for a terrible Kiosk, the tablet is almost ideally suited to the task. Tablets as Kiosks are making their presence known in places as diverse as malls, taxi cabs, hospitals, the Louisiana Department of Motor Vehicles, and the FastPass lanes at Disney World. I think the larger sized tablet is more appropriate for a Kiosk that the iPad Mini. But the iPad Mini would be perfect for smaller spaces such as in car dashboards, taxi cabs, banks, and such. Tablets are starting to show up as “loaners” that are lent out as entertainment devices. They’re being purchased by libraries. Airplanes run by Singapore Airlines and Qantas use them as in-flight entertainment devices. Airports like New York’s LaGuardia, Minneapolis-St. Paul International and Toronto Pearson International, lend them out to waiting passengers. The tablet is ideally suited for the task. It is light, it is portable, it is versatile, it displays content beautifully and it is sublimely easy to use. If the larger size tablet is ideal, then the iPad Mini is a dream come true. PCs in schools are mostly relegated to teachers and computer labs. Tablets live in the classroom and they reside in the hands of the students. No one wants to learn HOW to use computers anymore. Students simply want to use computers to help them learn. The tablet is starting to take educational institutions by storm. It acts as an electronic blackboard, as a digital textbook and as an interactive textbook. It’s at the K-12 level (the San Diego School district just ordered 26,000) and at the Universities (Adams Center for Teaching and Learning at Abilene Christian University, George Fox University, North Carolina State University in Raleigh). Tablets are even finding their way into the top-tier high schools in China. Some schools have even reported a 10% improvement in the exam scores of students who use tablets in lieu or paper books. We’ll have to see how the education market sorts itself out. But for smaller children at least, the smaller size of the iPad Mini seems like the perfect teaching tool. Now try to picture any of the above tasks being done with an Amzaon Kindle Fire, Google Nexus 7, or Microsoft Surface? More difficult, right? — The Amazon Kindle Fire has little chance because it has no tablet optimized apps and because the tablet is designed to pull the user into their store. — Nexus has little chane because it has no tablet optimized apps and because it relies on content and ad sales in order to make money. — Windows Surface has little chance…yet. Microsoft is very good at ecosystem, but their tablet offerings are currently unsuitable for the one-handed tasks that I listed, above. First, their tablets are too large. Second, the 16:9 ratio makes them awkward to hold in portrait mode. Third, their current iterations seemed focused on surface use, not hand held use. Fourth, and most importantly, they do not currently have the job-specific apps necessary to perform the required tasks. It is this last point that I want to dwell upon for a moment. When the press and the pundistocracy talk about apps, they usually focus on the big ticket items like Angry birds, Instagram, Facebook, Flipboard, etc. But the key to Apple’s app dominance are the untold number of proprietary, job specific apps designed by and for doctors, hospitals, park rangers, restaurants, entrepreneurs, businesses, educational institutions and government entities. THAT’s where the power of apps lies. Neither the 9.7 or the 7.9 inch iPad tablet are competitor proof. But if you need a hand-held tablet that’s serious about apps, then no one competes with the iPad Mini in that space.